With thanks to Dr. Helen Taylor Clinical Psychologist, and Vicki Dunham, Team Manager, Wirral CAMHS from Cheshire and Wirral Partnership NHS Foundation Trust talks about the development of their CAMHS Choice Clinic and how it is helping them to deliver on the THRIVE Framework (Wolpert et al., 2016) principles of high quality assessments with effective signposting and multi-agency liaison. The vision for CWP CAMHS is to provide safe, high quality, effective mental health services to young people and their families. By working closely with service-users, and in collaboration with local stakeholders, the Choice Clinic acts as an accessible and young-person friendly service, exemplifying a number of principles central to THRIVE. The Choice Clinic was established to offer a whole-system approach to care by implementing changes that focus on reducing barriers (both internally and externally). What is the Choice Clinic? The Choice Clinic offers young people and their families a single point of access. The clinic works in partnership with referrers and partner agencies to ensure the right level of intervention is offered to the right people at the right time. On a patient level, the clinic works to support patients from the moment of referral, towards developing a plan of treatment, to managing follow-ups, and dealing with everything that goes on in between. The clinic organises first appointments and, via letters that are regularly sent out, the clinic provides follow-up information to the families about the content of their care plan. Specialist mental health workers to meet with children and young people who have moderate or complex mental health difficulties at the first point of contact with CAMHS. The ethos of the clinic is that it keeps the goals and needs of the family and young person at the centre. The aim is to make sure that all patients receive a good quality first appointment that includes a robust assessment before beginning treatment to avoid re-assessment or lack of engagement later. By employing this collaborative approach, which adopts the CAPA choice model, the likelihood of patients getting the right level of support is substantially improved. How does the Choice Clinic implement the principles of the THRIVE Framework? The Choice Clinic has dedicated a significant amount of time to thinking through and implementing many of the principles outlined by the THRIVE Framework ‘Getting Advice’ and ‘Getting Help’ groupings. The aim is to ensure that those who go on to receive treatment are doing the right things with the right people and getting the right level of help at the right point. The THRIVE Framework — insofar as it emphasizes the need for good quality, front-loaded initial appointments at CAMHS, with effective use of signposting, multi-agency liaison, and advice giving — is central to the future plans of the Choice Clinic. Attention has been paid to front-loading services, which means that more time is being dedicated to initial assessments and to working with children who require additional treatment to collaboratively come up with a plan. The plan is a shared decision between the young person, family and professional that suits the individualised needs of the patient. One-off contact with the caregiver is now more common, and a significant amount of time is being dedicated to signposting and self-management. For those who receive additional treatment, treatment plans are developed that are goals-focussed and evidence informed. “The THRIVE Framework — insofar as it emphasizes the need for good quality, front-loaded initial appointments at CAMHS, with effective use of signposting, multi-agency liaison, and advice giving — is central to the future plans of the Choice Clinic”. What approach did you take to developing the Choice Clinic? The approach was multi-faceted, involving a move away from a tiered model to a whole-systems approach, a reduction of unnecessary barriers for families, and ensuring equitable access and waiting times for patients independent of location. 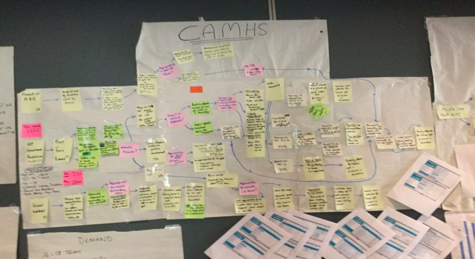 To achieve this, the CAMHS Choice Clinic adopted a leaner and more efficient model of care. Workflows were more clearly defined, and clinicians were freed from a lot of their administrative duties which enabled them to focus more on treatment and prioritise with fewer interruptions. Streamlining of workflows involved establishing clearer outcome measures and developing standardised care plans based on individual needs and goals. As a result, families are now able to journey through the service more smoothly with fewer hold-ups caused by internal transitions, duplication of work and ‘batching’ (for example, delays caused by looking at referrals once per week). In practice, to set up the Choice Clinic required starting with a wider discussion across the individual services and groups, working in collaboration on a proposal, and identifying leads to be champions and change makers involved in implementation (e.g. people to help create the clinic, administrators, clinicians, and community workers, etc.). It’s important to have clear roles. The earlier you identify the people who will be responsible, the earlier you can get going. Once the clinic was established, a database was set up to collect data from the beginning. An assistant psychologistwas hired to monitor outcomes and ensure clinicians were doing the right things. Meetings with staff are held twice daily so that staff could receive regular debriefs. Information updates were also regularly posted on an information board to ensure that staff members were always up to date (e.g. the percentage of patients transferred, or the number of people who needed appointments). How has the Choice Clinic affected service users? Ultimately, the Clinic was established to improve the experience for individuals and their families, and also to improve the quality and efficiency of care being provided. To achieve this, children and families are kept involved in the treatment process, and families and referrers are kept up to date on what is happening and what is planned. As a result of the changes that have been implemented, clients are getting fairer and more equitable treatment. In line with what is recommended, 60% of people who come into CAMHS are now being identified for more treatment and transferred to the help they need, whereas those who are not, are signposted to other agencies that can better support them. For those who go on to receive treatment, there is a clear contract and a clear plan for getting help and getting more help (NICE guidance clinical pathways are followed), as opposed to an open-ended approach. Those who do not go on to receive further treatment, and do not require additional medical services, are directed to additional resources. In terms of outcomes, one of the biggest challenges has been trying to get service-user involvement, since few service-users have been interested in attending focus groups. Nonetheless, throughout the pilot project, the team consulted with service-user participation workers in CAMHS to seek general advice from young people’s involvement groups about their ideas for the service. They also asked for families to volunteer to specifically represent service-users views on the clinic. So far, initial feedback has been acquired from the ‘Experience of Service’ questionnaire (ESQ) and a small number of telephone interviews. While there was some concern that changes would lead to worse outcomes for children and their families — since satisfaction levels were always high — recent reports indicate that service users continue to be satisfied with the service they receive (i.e. ~97% service-user satisfaction). How has the Choice Clinic affected staff? As a result of changes in how decisions are made, there has been an increase in skills sharing across staff, which has led staff members to feel like they’re learning more than ever before. Moreover, since clearer and more robust patient data is being collected, the clinic is able to keep track of what clinicians are recommending. This has encouraged others working across the clinic (such as senior clinicians) to challenge staff decisions and ensure standardisation of care. One of the aims of the Clinic was for staff to feel less stressed and more supported. Clinicians experienced some teething problems inevitable when learning a new way to work. We have tried to address concerns arising from staff as we go, and regularly survey staff and managers’ feedback about the new system. In general, by changing to a single point of access, changing the organisational structure, and by hiring of administrative staff to cover data collection, administrative tasks are now being taken off staff and clinicians are able to focus on clinical work. Not only has data collection improved markedly, but clinicians in general feel as though the day is more structured, that they’re more supported, and that they have more time to organise their work. For example, clinician admin has now reduced by 20 minutes as all routine outcome measures and ESQs are now inputted by admin. Feedback from the Trust, and our commissioners and referrers is overwhelmingly positive and they are pleased that it’s headed in a THRIVE-like direction. How are services working differently now? Services and care pathways are now linked according to the principles outlined by the THRIVE Framework. The Choice Clinic has reduced the number of potential disruptive transition points by centralising the point of access to CAMHS. Previously, a family may have been sent to see the Primary Mental Health Team, who then referred them to a tier three service, causing a delay while this is arranged and potentially another choice appointment. In the current clinic, cases are seen in one place and the decision regarding where they receive treatment are agreed on the same day. Managers meet weekly with Choice staff and can highlight any themes or issues of disagreement about Goal Based Care Plans, which are then fed into training and other systems in the Choice clinic to improve quality, but these do not disrupt families’ journey through the service. Referrals are screened every day, which has reduced the impact of ‘batching’ on the flow through the system. Cases are allocated to teams for partnership work on an internally shared database. Therefore, the managers of receiving teams can see in real time what will be coming through to their team and can begin the allocation process early. The photos below demonstrate the flow through the system before and after the establishment of the choice clinic to demonstrate how the LEAN process improved families’ journey through the system. What do commissioners think of the Choice Clinic? Commissioners were the first to request a single point of access. To date, commissioners have been delighted with the outcomes — especially the referral process, which is now simpler and easier for stakeholders to understand. They are also impressed with the data collection process and with the overall improvement in the organisation of the data, which has led to an increase in the quality of care, better outcomes for patients, and increased efficiency. The Clinic is now in the process of starting to work with partnership agencies to share their waiting list and to develop more integrated care pathways. For example, they are beginning to work with Response (local authority) to consult with them and ensure that children and their families are getting the right level of help. If this proves successful, the Clinic will continue to involve other agencies. CWP is also working towards adopting self-referrals. There will also be continued improvement to data collection, and computerized waiting lists will be used to monitor data quickly and accurately. Better quality information will also be collected to inform future transformation projects, such as the development of Care Pathways. This information will include an assessment of service-user experience, which will continue to be measured through focus groups and feedback forms given to young people and their parents attending the clinic. The voice of the service-user is recognized as central to all transformational change, so as the Choice Clinic continues to grow, it will be central to the shaping of the service. Thank you to Joshua Chauvin for his help in developing and writing this case study.